If you’re in the Belleville area on June 10th you should probably check out the Bay of Quinte Art & Wine Festival happening downtown. There will be local artists showing and selling their works. While perusing the art, you can sample local wine (or beer) and have a snack from a local food vendor, and enjoy the sounds of the Quinte Symphony. The festival is taking place from 10 am to 8 pm to suit morning and evening people alike. For the latest info about this event, follow them on twitter at @BoQ_Art_Wine. If you’re an artist, food vendor, or beverage producer and would like to get involved, I believe that they still have spaces available so get in touch with them via their website or social media. The lovely image used on the banner of the BOQ Art& Wine website is of a painting by my talented neighbour (and cat sitter extraordinaire) Claudette Belanger. Tags: art, Bay of Quinte, Bay of Quinte Art & Wine, beer, Belleville, BOQ, Canada, festival, food, Ontario, Quinte Sunrise Rotary Club, wine | Permalink. I saw the tweet (above) yesterday. 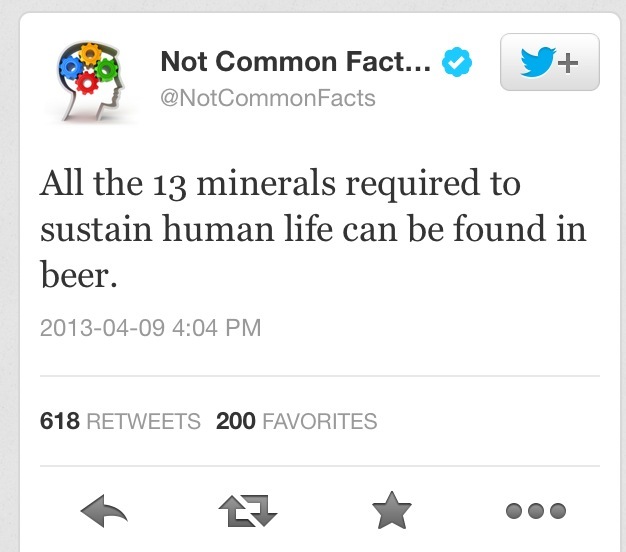 While it may be true that beer contains all 13 essential minerals (I say “may” because the nutrient profile only lists 11 minerals) I still think that this tweet is misleading. Oh sure, it’s all fun and games, until someone loses a liver. I enjoy a good beer as much as the next person, but I hate to think that anyone would believe that they can obtain all the nutrition that they need from beer. Let’s assume that the two minerals not listed in the nutrient profile are indeed present in beer. There is certainly not enough of each of these minerals (some are present in extremely small quantities) to meet your daily requirements. For example, a female between the ages of 19 and 51 needs 18 mg of iron a day. One bottle of beer provides 0.7 mg of iron. That’s about 3.8% of the recommended intake for iron. Just for fun, that would mean drinking nearly 26 bottles of beer to meet your daily requirement. The tweet also neglects to mention that there are other substances required for human life; such as, vitamins and macronutrients (carbohydrate, fat, and protein). Beer is lacking in all of these areas, aside from carbohydrate. Most of beers calories come from alcohol, which, unsurprisingly, is not an essential nutrient. Another factor to consider: alcoholics tend to be one of the highest risk groups for nutrient deficiency (in the Western world). This is due to lack of consumption of nutrients from food, a need for more nutrients to repair the damage caused by excessive alcohol consumption, and impairment of digestion caused by alcohol consumption. 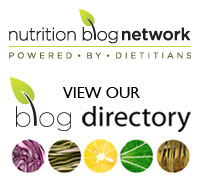 Tags: alcohol, beer, minerals, nutrition | Permalink. Still getting caught up on my article reading from the holidays. I started reading the article in the National Post entitled: Why beer’s good for you: Compound in hops may help fend off cold-like symptoms. I anticipated a blog post about how ridiculous the study was. However, the article turned out to be a little bit different from what one might expect based on the headline. The research was done by the “Sapporo Medical University”. For those of you who don’t know; Sapporo is a beer. Clearly this study was not conducted by unbiased researchers. However, the author points out that this research should be taken with a grain of salt. One of the Sapporo researchers is quoted as saying that such small quantities of the cold-fighting compound were present in beer that a person would have to drink 30 beers in order to obtain the virus-fighting benefits. Obviously drinking 30 beers for any reason, not just for cold protection, is unreasonable. Despite this, the potential benefits that could be obtained from this compound (humulone which is present in the hops in beer) are an interesting outcome of the research. Where does my usual ranting come in, you may be wondering. Right about now. My issue is with the headline. This isn’t the first time that I’ve seen copywriters writing headlines that tout the exact opposite message of what’s actually contained in the article. Sure, you want to get readers but I don’t think that drawing people in with incorrect and misleading headlines is the way to do it. It does nothing for the credibility of your publication. Try writing a headline that actually corresponds with the information contained in the article. Tags: beer, cold-cures, headlines, hops, humulone | Permalink. I’m forgoing my usual Follow Friday post to tell you all that it’s National Beer Lovers Day! I feel that I have a responsibility to tell you that I am not encouraging drinking, especially to excess. If you do drink, please do so responsibly and never drink and drive! Now that that’s out of the way, for those of us who do enjoy the occasional pint, there may be some additional health benefits. Moderate consumption of beer (i.e. one drink a day for women and two a day for men, and no, you can’t save them up) may reduce your risk of heart disease and stroke. It may also reduce your risk of gallstones. Beer also has a fair amount of silicon which may reduce your risk of osteoporosis. While beer varies in calorie and nutrient content, an average can of beer (355 ml) contains about 150 calories, 14 mg of calcium, 21 mg of magnesium, and 2.1 micrograms of selenium.